International storyteller Shonaleigh Cumbers is coming to Aotearoa New Zealand! The Story Collective were very proud to collaborate with In the Belly of the Whale School of Storytelling to bring internationally acclaimed storyteller, Shonaleigh Cumbers back to New Zealand. 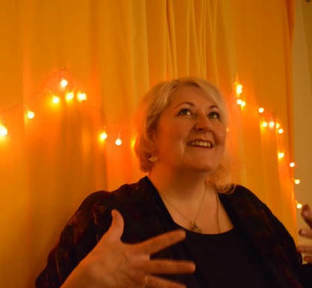 We last welcomed Shonaleigh to Christchurch in May 2014 when she entertained us with a lively workshop and gripping tale of 'The Tower of Bagel'. Shonaleigh brought with her a rich and ancient tradition of Jewish storytelling. An authentic 'Drut'syla', she was schooled by her Bubbe (Grandmother) in the traditional method of telling that has been handed down through generations. The Drut'syla repertoire comprises 12 interlinked cycles, each of several hundred tales. Training involves a complex system of oral memorisation, visualisation and interpretation (midrash) of tales. Historically, following training, each Drut'syla would act as hereditary storyteller-in-residence to her own immediate community. However, the tradition was uprooted, and came close to extinction, in the mid-20th century due to the Second World War and more specifically, the Holocaust. Shonaleigh has been active mainly as a professional storyteller to a secular public, actively working to expand and share her tradition. She has a repertoire of over 4000 stories (!!!) which can be adapted as appropriate for the theme and audience with whom she is working, be it to communicate, counsel or comfort. In this way the stories are 'alive' and interactive. Such a vibrant, tangible method of storytelling remains relevant today in our 24/7 world, where we communicate in cyberspace via phones and laptops – and yet still strive for a deeper, more meaningful connection. Shonaleigh generously arranged to deliver a free story-telling evening , a weekend event, a performance and a 5-day residential course. There was a great turn out for all events - and many beautiful stories told that will reverbarate around our hearts and minds for many months to come. Shonaleigh has an outstanding reputation among the storytelling world. She has performed in venues from church halls to London’s Albert Hall, from forests to the Barbican, and at festivals in the UK, Europe, America and New Zealand. She also works in schools and among community groups, helping people, particularly teenagers and immigrant communities, find their voice. Shonaleigh was the UK’s Deputy National Storytelling Laureate from 2010–2012, has completed commissions for the British Library, the British Museum and Hay-on-Wye Literature Festival, and is a regular contributor to BBC arts programs. Her 2012 appointment as Artistic Director of Phrase Arts, where she helped promote storytelling within communities, has led to her work with the European Court of Human Rights. She was Teller In Residence at the International Storytelling Center in Tennessee. Everyone is still buzzing from the extraordinary 5-day residential course, brimming with creativity, fun and connection. Open to all, Shonaleigh told the ancient story about the Golem, a magical man-made creature. The free event was held at Christchurch's new central library Turanga. For those with only a weekend spare but who still wanted a rich, immersive experience, Shonaleigh hosted a weekend event in Christchurch.